Oracle Solaris - please note that our Solaris courses are retired from the end of October 2017. On-site dedicated courses will still be available for the forseeable future. As with many other operating systems and applications, a certification path is available for the Solaris administrator. The certification is achieved by passing exams run independently of Oracle by the Pearson VUE organisation, who have many testing centres around the UK. Contrary to rumours, and as many of our clients will verify, you don't have to attend Oracle's courses to sit (and pass) these exams! Well, maybe one....see below. The above courses, taken in the order shown, will more than prepare you for the Solaris Certified Administrator and also for the Solaris Network Administrator. Note that there is also a Solaris Security expert certification, for which First Alternative do not offer a course. Oracle Certified Associate (1Z0-821), and the Upgrade to Oracle Certified Professional (1Z0-820) do not require attendance on a Oracle course. Oracle Certified Professional, Oracle Solaris 11 System Administrator does require attendance on a "approved" course. There are currently June 2013) no Solaris 11 Security Administrator or Solaris 11 Network Administrator certifications. Solaris 11 Administration (course code S11A - reaching this level covers the 1Z0-821 exam). Solaris 11 Advanced Administration (course code S11B - reaching this level covers the 1Z0-822 exam). See here for full details of Solaris 11 certification at the Oracle web site. Additional recommendations: As a delegate, you should also have a fair degree of practical experience in readiness for the broad-based Solaris and networking topics you may meet on the question papers. However, Oracle now demand that, if you are a new Solaris administrator, that you must attend one of their courses (including a choice of several that are not directly relevant to the certification). If you hold an existing certification from say Solaris 9, and wish to upgrade there is no requirement to attend an Oracle course. Oracle Linux Systems Administrator and Implementation Specialist. LPI is a vendor-neutral certification and is taken through the Pearson VUE testing organisation, for which there are many testing centres around the country. For full information about the LPI exams, look at www.pearsonvue.com. This web site contains not only registration details, but also telephone numbers of regional offices. RedHat Linux certifications are run by RedHat themselves. Full details are available at www.redhat.co.uk. 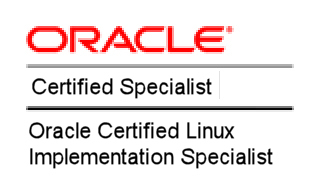 As an alternative to RedHat, Oracle also offer Oracle Linux certifications via Pearson VUE. Oracle Linux is a direct derivative of RedHat Linux. There are two exams, Oracle Linux 5 & 6 Administration (1Z0-100) and Oracle Linux 6 Advanced Systems Administrator (1Z0-105). There is also a certification called Oracle Linux Implementation Specialist, which is intended for technicians employed by, or involved with Oracle sales partners. There does not seem to be anything on the horizon regarding Oracle Linux 7 (Dec 2017). Our courses are aimed at the practical aspects of the use and administration of Linux, in particular the RedHat linux system (easily the most popular distribution in the UK). The LPI certification exams will ask questions on other versions of Linux such as Debian, which we do not cover. However, our courses cover about 90% of what is required, and there are exam guides available to study to pick up on the additional "odds and ends" for those who wish to be totally thorough! Ideally, you should combine the above with about 6 months of practical experience, and study the exam guides carefully.